The Iran nuclear crisis is now seven years old - that is a long time to stay in crisis mode. Since the crisis erupted in 2002, the UN has imposed three ineffective and watered-down rounds of sanctions aimed at forcing Iran to give up its nuclear program. Despite the baloney being served up by the slice at the UN, Iran's nuclear program isn't seven years old - just the crisis. The Iranian nuclear program is nearly as old as the Islamic Republic, dating all the way back to the 1980-1988 Iran-Iraq War. There were high hopes in the West when 'reformer' candidate Mohammed Khatami was elected in 1997. As it turned out, Khatami was really a shill; it was during his watch that Iran's nuclear standoff began. In 2004, Khatami concluded a deal with the EU under which Iran agreed to suspend most of its uranium enrichment. 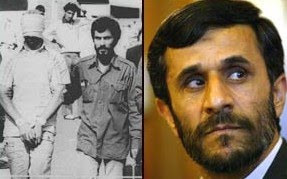 The following year, Khatami was defeated by hardliner Mahmoud Ahmadinejad, former mayor of Tehran and believed to be among those who took over the US embassy and took its staff hostage in 1979. Ahmadinejad was elected president in June, 2005. The following month, Iran announced it was resuming nuclear enrichment. In 2006 as the UN negotiated, Ahmadinejad hosted an international conference on the Holocaust under the working title, "A world without America or Israel". The purpose of the conference was to deny the Holocaust ever occurred. In 2007, with the rest of the world hammering the Bush administration for allegedly 'cooking the books' in its effort to make the case for war against Iraq, the US intelligence community issued a joint threat assessment concerning Iran. The consensus opinion of the gun-shy intelligence agencies was that the threat posed by Iran's nuclear program was overblown. Oddly, this report gets even MORE criticism than did the report that concluded Iraq had a WMD program. By then, the Bush administration was so tainted by the constant hammering from the Left that nobody wanted to risk anything controversial. Thoroughly beaten down by this point, the Bush administration was just marking time until the end of their second term. Obama had made rapprochement with Iran the centerpiece of his international foreign policy during his campaign. So let Obama deal with it. The genie is now out of the bottle. The horses have already escaped from the barn. Pandora's Box now stands wide open. We've crossed the Rubicon. Iran has passed the point of no return and America will soon be up the creek without a paddle. I often wonder if we'd have been up the same creek today if the Bush administration hadn't been so totally delegitimized by eight years of constant opposition on ideological grounds, irrespective of the threat. I mean, let's be real. On the very eve of war with Iraq, several Democrat representatives, including Jim McDermott of Washington State and David Bonior from Michigan appeared on CNN live from Baghdad! Speaking from the heart of the enemy capital in time of war, they viciously attacked their own government. McDermott sided with Saddam in opposing what McDermott calls the ``coercive stuff'' - inspections backed by force, which were the only kind that had even a remote chance of being productive. Parroting Saddam's line to perfection, he said ``Iraq did not drive the inspectors out, we'' - actually, the U.N. - ``took them out. So they should be given a chance.'' His implication was that America, not Iraq, foiled the inspections. During the election campaign, Obama's pastor, Reverend Jeremiah Wright made headlines when he said September 11 attacks were the result of "America's chickens coming home to roost." The Obama administration's crisis with Iran is more a case of the Left's chickens showing up at their door. I was struck by the familiar tone taken by Iran's Foreign Minister, Manucheher Mottaki in response to Secretary of State Hillary Clinton's call for increasing the sanctions against Iran. Mottaki said his government no longer takes Mrs. Clinton seriously, saying, “Mrs. Clinton’s efforts to take America back to the failed policies of the Bush administration era will not benefit the people or the government of that country,” Mottaki said. Honestly, I can't quite identify the 'failed policies' of the Bush administration in context, since the Obama administration's efforts to 'right the ship' have all collapsed - because the 'failed policies' of the Bush administration remain the best options available. Gitmo is a 'failed policy' of the Bush administration that Obama promised to make right. Gitmo is still there and still occupied. It is his alternative policy of bringing them to America is the policy that is failing. Iraq was a 'failed' policy. However, it attracted jihadists like flies to honey. But since the jihadists were in Iraq fighting well-armed and well-trained US forces, they weren't in America killing unarmed and untrained American civilians. So too, was the war in Afghanistan a failed Bush policy. But Iraq also distracted the terrorists away from Afghanistan. Once the Iraq War was lost, they reconverged on Afghanistan - and Obama wasn't ready. The fact is that the 'failed Bush policies' kept America safe from attack upon her shores right up until the day Bush left office. Obama reversed the 'failed' policy of treating terrorists like enemy combatants and ordered the military tribunals closed. Since then, there have been several attacks inside the United States, including the Fort Hood Massacre - and the Christmas Day bombing that only failed because the bomb failed to detonate properly. When one gets right down to it, the division between the Left and the Right is only partly political. I believe it is primarily rooted, not so much in politics, but rather according to worldview. The Left is primarily anti-Christian. That will make some of them howl, but our ideological divisions are what they are - and they split along religious lines. The Left is pro-abortion, pro-gay marriage, anti-religion, heck, you can argue all you want to the contrary but the fact is that the ACLU represents the views of the Left and the Rutherford Institute represents the Right. The ACLU is an atheist organization; the Rutherford Institute's focus is protecting Christian civil liberties from ACLU lawsuits. America was settled by the Puritan Pilgrims, founded on Christian principles and testified to a national belief in a Creator-God as part of the Declaration of Independence. Over the course of America's history, it has been blessed accordingly. But over the course of the past half-century, Americans have increasingly polarized along Christian, (not merely 'religious') lines. One can criticize Christianity today and win an election. If one dares to criticize any other religion, (except Judaism), and one is immediately labeled 'a bigot'. For almost all of her existence, at least until this generation, America was not shy about confessing Jesus Christ. And it is obvious that Jesus confessed America's name before the Father. No nation in the history of the world, before or since, has come close to reaping the abundance of blessings showered upon America. It is equally obvious that over the course of the past few decades, those blessings have become further between. Because Jesus ALSO said, "But whosoever shall deny Me before men, him will I also deny before My Father which is in heaven." One can track the increasing 'variance' without too much trouble. A recent poll showed that America is more 'at variance' than at any time in her history. Especially since Obama's election. Obama is the most polarizing president in American history, according to a poll released by the Gallup organization on the occasion of the administration's first year anniversary. The average difference in Obama's approval ratings between Democrats and Republicans turned out to be 65 percent - the highest first-year gap of any president so measured. "The extraordinary level of polarization in Obama's first year in office is a combination of declining support from Republicans coupled with high and sustained approval from Democrats," Gallup's Jeffrey Jones reported. But the polarizing of America didn't begin with Obama. It began with Ronald Reagan. who, as it turned out, was both a Bible believer and student of Bible prophecy. Things have only become more polarized in the years since. The reason is because the Bible is true. Jesus is real and He is alive, which is why nobody can be neutral concerning Him. Not the Left. Not the Right. Not even the Middle. Look around. They know as well as we do, whether they choose to acknowledge it or not. They know He is coming again. And that He is coming again soon. That's why they seem so angry all the time.